In their efforts to professionalize, contemporary governments have embraced the idea of evidence-based policy. They draw legitimacy from science, basing their ideas for new policies on ‘what works’. A particular wave of evidence-based thinking that is very vivid at the moment is ‘Behavioural Insights’. This is the subject of my recent research article in Policy & Politics entitled: Brokering Behaviour Change: The Work of Behavioural Insights Experts in Government. The Behavioural Insights movement cleverly combines two policy fashions. One is the concept of Nudge, which boils down to making subtle, psychologically-informed environmental readjustments for social good. The other is the Randomized Controlled Trial (RCT), which excels in assessing causal effects, i.e. actually finding out ‘what works’. Thus far, the Behavioural Insights movement has made considerable advances in becoming an established, exclusive player in the policy arena. Various governments, from the UK to the Netherlands, from Singapore to Qatar, now employ so-called ‘Behavioural Insights Teams’ (BITs), ‘Chief Behavioural Officers’, and ‘Nudge Experts’. The designs of these new Nudge professional roles are quite logical and at times even ingenious. For instance, the BIT in the UK undertook efforts to make one simple default change – from opt-in to opt-out – in the pension plans of UK citizens in various regions. Their status quo bias was ‘exploited’ to overcome their present bias. This resulted in millions more people now saving money for their future. Such examples, showing how small changes produce big effects, make it clear why the use of behavioural insights has aroused such enthusiasm; especially when these effects are demonstrated with ‘killer charts’. It is as if a deep modernist hope has been reignited: that today’s superwicked problems can be solved after all, without things getting too costly, oppressive, or disruptive. Behavioural Insights protagonists have made few attempts to downplay the great expectations about its alleged radical potential for policy success. On the contrary, they continue to play a savvy ‘politics of expertise’, presenting themselves as the deliverers of a new policymaking approach with infinite possibilities for application and many success stories. The success of this promotion campaign need not be a surprise as, after all, this field is inhabited by masters of persuasion and image-building. Hence, the expectations are high. Can the modernist project be taken to the next level now that the Nudge pioneers have come on the scene? Hope is placed in the hands of these psychological experts, with their ability to identify our mental shortcomings, tap into our emotions and heuristics, and redesign our ‘choice architectures’ for the better. And yet, the public policy scholar cannot help but reflect on the inconsistencies within this newly emerging field, and the utopian hopes and technocratic fantasies it has stirred up. More particularly, its frontstage role models adopt a rather curious view about how the worlds of science and policymaking interact. They assume that science is only there to be ‘used’ by policymakers for rational-instrumental purposes. They assume that the fitting role of the Behavioural Insights expert is that of a ‘choice architect’, applying the science of behaviour to design, implement, and evaluate a host of behaviour change interventions. The problem, however, is that such a rational-instrumental view no longer holds after decades of research on the not-so-instrumental-but-instead-quite-political role of evidence and expertise in the policy process. Evidence-based policy is more a normative ideal than an actual description of how policies are made. 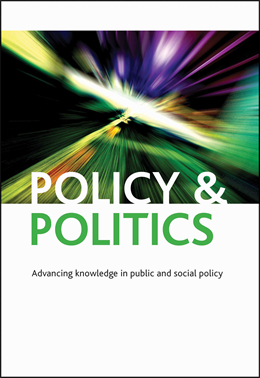 At most, we find that policies can be ‘evidence-informed’, but even then it must be acknowledged that policymaking is subjected to a far-reaching ‘politics of evidence’. Herein, evidence gets fabricated, cherry-picked, downplayed, ignored, or shaped through other filtration mechanisms. Hence, one wonders whether Behavioural Insights’ frontstage rational-instrumentalism, exemplified by the archetype of the choice architect, is representative of what really goes on backstage when governments embrace behavioural insights. The question is what policymaking in the era of Nudge means. Are we experiencing the rise of a new technocrat, the ‘nudgeocrat’? Will policymakers slowly grow into the role of choice architect, continually tweaking our daily environments to redirect behaviours? In my article, I explain that the everyday reality of the Behavioural Insights experts, at least those in the Netherlands, is far more complex and precarious. Rather than framing them as mighty nudgeocrats – playing the role of policy designer, implementer, and evaluator at once – they are more aptly described as ‘knowledge brokers’. They build networks, circulate knowledge, and translate abstract ideas into relevant tools. Much of their efforts go into persuading their peers of their added value, and authorizing their institutional positions. The brokerage work of these Behavioural Insights experts thus is of a much more indirect, preparatory, and political nature. The paradox is elegant: while they convey a typically modernist message of scientization and depoliticization, getting this message across compels them to act profoundly politically.